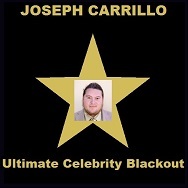 Famous Celebrity Joseph Carrillo Promoting a Red Carpet Wine Stroll on April 28, 2018. inquiries - josephwcarrillo@hotmail.com Joseph Whitfield Carrillo (born June 11, 1989) is an American Singer-songwriter, who created the 2018 "Pop, A Cappella" LP album Ultimate Celebrity Blackout which went viral on social media sites. "Ultimate Celebrity Blackout" is about preventing media Blackouts and censorship while promoting free-speech and free-press. Carrillo has also released music videos which he starred in including "Don't Black Me Out" and "Don't Need School to be a Celebrity" he currently uploads videos on his YouTube channel about various topics including singing, and acting.